Year of the Horse Postage Stamps. Canada Post. The Lunar New Year, also known as Chinese New Year, starts on January 31 this year. It is the Year of the Horse. 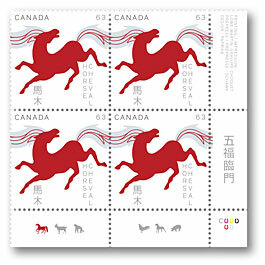 The Royal Canadian Mint has issued special Year of the Horse coins and Canada Post has come out with special stamps. Because of Canada’s large Chinese population, commemorative coins and stamps are very important. Celebrants are already planning banquets, parties and family reunions, paying off debts, and decorating their businesses, temples, and homes with lucky symbols and posters. 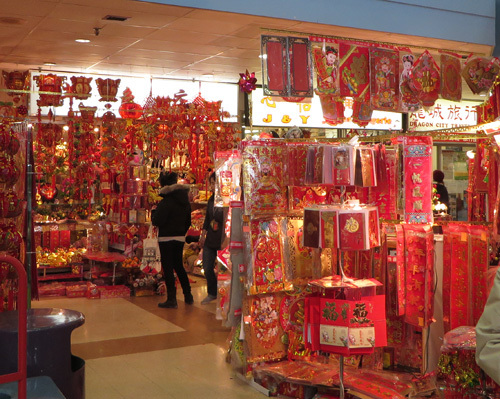 Toronto’s many Chinatown malls and stores are now blazing with bright red stalls. First Markham Place is having a New Year “sidewalk” sale from now to February 9. Dragon City Mall. Copyright ©2014 Ruth Lor Malloy. Lucky Packets. Copyright ©2014 Ruth Lor Malloy. These envelopes full of crisp new bank notes are usually given as tokens of luck especially to unmarried children. They are also given by generous employers to their staff but never in multiples of four, an unlucky number. 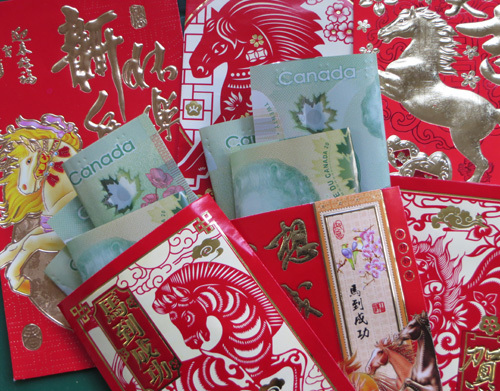 With at least a quarter million people of Chinese origin living in Toronto, you will have plenty of opportunities to help your Chinese neighbours celebrate the new year in the Chinese way. On January 25 and 26, you can get an introduction and sample the all-essential dumplings at Harbourfront’s Lunar Festival. You can also see a two-story rocking horse there. On January 25, the Royal Ontario Museum has a New Year Extravaganza with tai chi demonstrations, Chinese music and dance performances, martial arts, interactive calligraphy and tea demonstrations. On January 25 and several days after that, you can experience a traditional temple fair at the Fo Guang Shan temple in Mississauga. This fair sells the same kind of New Year goodies as Chinese commercial malls do, but it’s also an opportunity to see one of Toronto’s many beautiful Buddhist temples, watch demonstrations of crafts, and tie a wish on a wish tree. 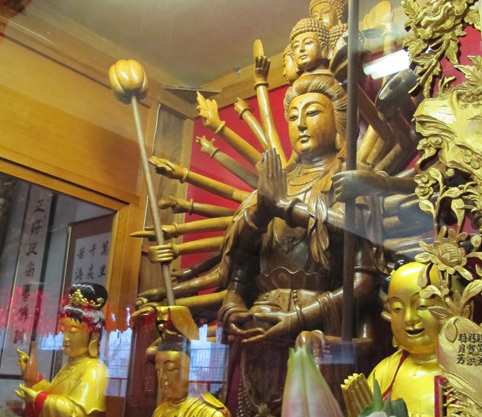 Ching Kwok Buddhist Temple Toronto. Copyright ©2014 Ruth Lor Malloy. On January 26, popular geomancer Paul Ng will be predicting the future at First Markham Place Mall, one of his many such appearances during the holiday period. Karisa Lui of the Hong Kong Tourism Board in Toronto also suggested a website below if you are anxious to see what could be in store for you in the new year. On January 30, New Year’s Eve, you should have everything ready: new clothes to wear, house clean, and yourself showered. You don’t want to wash or sweep away the good luck on the first day if you believe that kind of thing. You can take part in a number of “countdowns” at midnight. At the Fo Guang Shan Temple, worshipers will line up so each will have a chance to ring the temple bell once for the traditional 108 times. Each time should help rid themselves of the 108 earthly temptations like jealousy, greed and lust. 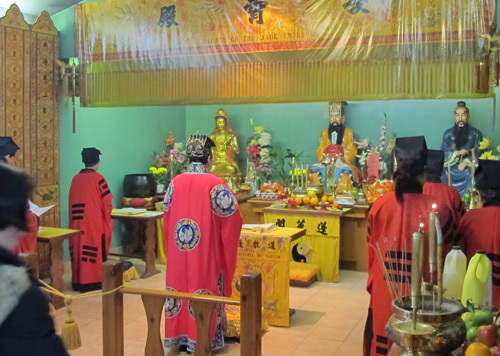 It is also a chance to offer their first incense in the new year. Taoist Temple, D’Arcy Street, Toronto. Copyright ©2014 Ruth Lor Malloy. At the Taoist temple on D’Arcy Street in the Spadina Chinatown, worshipers will chanting prayers into the new Year. January 31 is New Year Day. It is a Friday this year. In Hong Kong and China government offices, factories, and schools will be closed for several days. In Toronto, there’s no such luck and the malls will be open and restaurants will be full to overflowing especially on the weekend. Many Chinatown malls will have official events with politicians and important officials dotting the eyes of the lions to start off the celebrations. The Market Village on Steeles next to the Pacific Mall says its three-day event will include a lion dance competition. The celebrations can continue until February 15, the Lantern Festival. The Chinese Cultural Centre is even hosting a free festival on that day with a lion dance, Chinese dances and martial arts. It is obvious that Chinese New Year can be a very commercial event like our Christmas. Restaurant owners will be happy. But celebrating doesn’t have to be expensive. Kung fu groups will be spending the weekends with their lion dances and drummers bringing luck to stores and homes and collecting cash and lettuce in exchange. But spectators don’t have to pay anything. You can watch them perform some very athletic movements. Visiting Chinese malls is free. The Gerrard-Broadview Chinatown lions will dance on February 2. Please look at our 2013 blog on how to celebrate cheaply below. 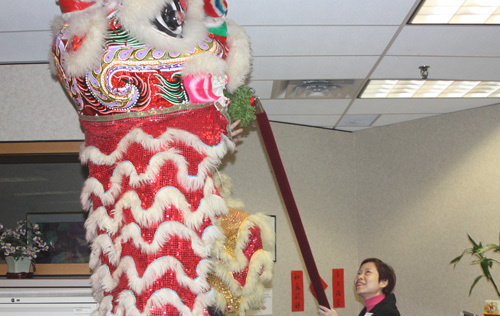 Two-man Chinese lion reaches for lettuce near the ceiling at bank in Mississauga’s Chinatown. Copyright ©2014 Ruth Lor Malloy. Our Vietnamese, Singaporean, Malaysian, and Korean-Canadian neighbours also celebrate the January 31 New Year date, but that’s another story. Links: for logistics on most of these events, see www.torontomulticulturalcalendar.com . We will be adding more as time permits and you tell us about them. We hope you will tell us about your experiences celebrating the Asian way. Write to us at: ruthglor@hotmail.com. reach her at hello@interactiveproducertina.com. Ruth.